There’s nothing like being at home, relaxing in a warm bed, enjoying the aroma of a pie coming out of the oven, sharing a laugh with family and friends. But did you know that the majority of fire deaths occur in the home? It’s important to take precautions to provide adequate fire safety for everyone. Home fire sprinklers can contain and may even put out a fire in less time than it would take the fire department to arrive. In choosing an apartment or purchasing a home, look for a residence that has home fire sprinklers. Test your smoke alarm at least once a month by pushing the test button. If you can’t reach the alarm, consider getting alarms that you can test with a flashlight or a television remote. For added safety, interconnect all the smoke alarms so that when one sounds they all sound. This gives everyone more time to escape. Smoke alarms with non-replaceable (long-life) batteries are designed to remain effective for up to 10 years. They can be helpful for people who have difficulty changing batteries. Smoke alarms and alert devices, called accessories, are available for people who are deaf. Strobe lights throughout the home are activated by smoke alarms and alert people who are deaf to fire conditions. When people who are deaf are asleep, a high intensity strobe light is required along with a pillow or bed shaker to wake them up and alert them to fire conditions. Smoke alarm alert devices, called accessories, are available for people who are hard of hearing. These accessories produce a loud, mixed low-pitched sound. This equipment is activated by the sound of the smoke alarm and is usually installed next to the bed. People who are deaf may find that a pillow or bed shaker is also helpful to wake them. Ask the Fire District to review your escape plan. 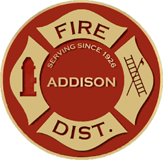 The Addison Fire Protection District participates in a voluntary Premise Alert Program for people who may need extra assistance. If you have a service animal, discuss with your fire department plans to evacuate the animal with you. Keep a phone by your bed for emergency calls in case you become trapped and are unable to escape.